I'm 35 and a half weeks pregnant. Not quite full term, but not far off it. So here's my current birth plan: have some friends round the morning I hit 37 weeks; clean up afterwards; chill out as a family of three in the afternoon; put MM to bed; go into labour; pop the baby out 30 or so minutes later. I keep joking about this, but I really am hoping the baby arrives as soon as it's safe to do so (and that jinxes are not a real thing and that I'm not therefore condemning myself to a five year pregnancy by writing this). There are obvious reasons why being pregnant is losing its novelty - restless nights; heartburn; the inability to put my socks on in a dignified manner - but it's not any of those things which are making me hope for an early finish. This has been a pretty easy pregnancy overall; even at this late stage, there are times when I feel so normal that I can forget I'm growing a human. So it's not for my body's sake that I'm googling old wives' tales about kickstarting labour. No, I'm hoping the baby comes early because of parent guilt. Because, when I told MM that one of her friend's mummies is pregnant, too, her response was: "Oh. Can SHE get down on the floor and play?" Just so we're clear: I can't. Or not for as long as she'd like. And there's little MM loves more than getting down on the floor for a picnic (real or make-believe - it's irrelevant) or a massive brick building marathon. On top of that, there are days when my patience is shot. More so than usual. More so than I'm happy about. It's hard to keep calm when it causes me physical pain to crouch beside the potty, to climb out of bed at 3am to help her find a missing toy, or to chase her around the flat, trying to lasso her legs into clothes. It's hard not to mind the spread of toys across the floor when I can barely stoop to tidy. It's hard to enjoy a toddler-paced walk when I JUST WANT TO SIT DOWN ALREADY and nobody's bouying me up with snacks. I feel guilty about how much time we spend at home; I feel bad that the majority of our play dates are at our place. To make up for all the extra time indoors, I send MM out to play with other people. She spends a few hours a week with Steve's parents; she spends a full day with our neighbour fairly regularly; she and Steve have a weekend dance class they go to without me. Even then, I feel guilty - she's used to spending so much time with me, I worry that she's feeling rejected. When she asks to stay at home with me, I feel bad talking her into leaving. When she comes back with stories of the great time she's had, I feel a little jealous. 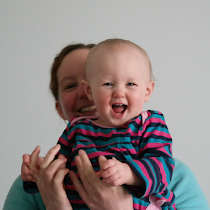 This, despite being convinced that she's ready for a taste of independence - despite feeling sad that she's got ten more months before she starts nursery. The guilt is real. I'm so, so proud of how patient MM has been about the whole thing. She has accepted without complaint that I can't take her on as many outings as usual; she has accepted with only minimal complaint that I can only really play games which involve me sitting on on a yoga ball; she has given me lovely hugs and not-in-the-least-bit-relaxing back rubs when I've told her that I'm in pain. She's been absolutely awesome. But I feel guilty that she has had to be. She asked us for a baby; she didn't ask us for nine months of a tired, achy, increasingly pregnant mother. And, oh, I know that things aren't going to spring back to the way they used to be once the baby's here. She's going to have to get used to sharing our time and our attention. She's going to have to deal with exhausted parents whose tempers are frayed. I'm going to have a whole new set of things to feel guilty about. But at least when I can play with her, I CAN PLAY WITH HER. I'll be able to get down to her level and stay there (until her baby sibling's next feed). So I'm hoping for an early birth. I'm looking forward to getting my body back - not for me, but for her. And fingers crossed the new baby's a good sleeper, because I could do with getting my patience back, too.